Size: 9.3" x 7.3" x 2.8"
This calculator looks similar to the TI-5040 but misses a display and outputs the results only on a thermal printer. Like the TI-5220 the TI-5015 added the useful GT (grand total) feature to the basic functions. Dismantling a TI-5015 manufactured in Italy reveals a clean design centered around a TMS1118 Single-Chip Microcontroller based on the famous TMS1000 core. Similiar chips were used in the never released SR-40 (Prototype) and the successful TI-5050M. The thermal paper used with this printer (TP-30250 2-1/2" wide and 14 Feet length) was discontinued long time ago. In 2008 Appleton (Appleton, WI) manufactured with the Alpha 800-2.4 paper still a compatible paper. 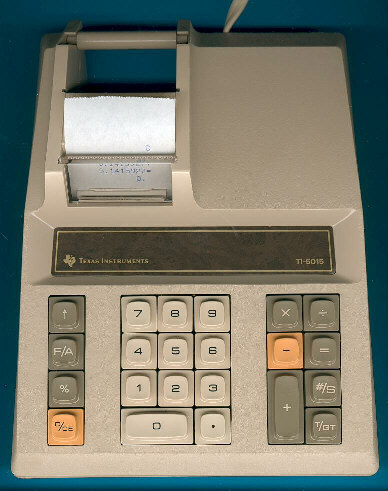 A printing calculator with independent add register … and grand total. Attractive. Economical. Prints a clear, legible tape. Quickly. Whisper-quiet. Using standard business machine sequence, this light-weight compact calculator adds, subtracts, multiplies and divides. Handles multiplications and divisions of a constant, automatic percentages and credit balance. The independent add register allows you o perform multiplication and division without affecting previous add/subtract entries. Non-add key prints reference numbers without affecting calculations. Grand total register automatically accumulates totals from the add register. And, its ribbon-less printer is as reliable as it is quiet, while quality is consistently high.